Penn Brewery, or more formally, Pennsylvania Brewing Company, was the first micro in the Keystone State, founded in 1986 on the historical site of a pre-pro Eberhardt & Ober Brewery. Its founders, Tom & Mary Pastorious, were instrumental in getting the brewpub laws changed in PA to allow operation of a restaurant on the site of their brewing operations. Penn’s beers have gone through several incarnations, starting originally as a contract brew through Pittsburgh Brewing Company, but then brewed on site starting in about 1989 for nearly twenty years, before being contracted again to Lion Brewery in Wilkes-Barre, PA (where my sample was brewed) in early 2009 as the brewery and restaurant closed. Several months ago, production was restarted again on site and the restaurant was reopened as the original owners reacquired the operation after having sold out nearly a decade ago. From the beginning, they’ve prided themselves in brewing German Reinheitsgebot beer which served as German brewing law until 1992—that is to say, using only the traditional ingredients of water, malted grains, hops and yeast. Their Penn Pilsner has been considered their flagship brand from the beginning and it took home a Gold Medal in 2001 from the National Beverage Tasting Institute. The first thing I noticed in pouring the beer was the bright, copper color, which is obviously a little darker than one might expect to see in a typical pilsner. It also loses its head rather quickly, even if the glass does manage to maintain its lacing. A true pilsner, it is said, should take seven minutes to pour, as the slowly evaporating head will not allow it to be poured more quickly. The first taste is surprisingly sweet and it’s apparent the brewers are pursuing a more Bavarian-style pilsner (as opposed to the paler and crisper Bohemian versions or the drier Northern German varieties). With a hoppy Hallertau bite that’s rather more of a nibble, this brew could easily be considered a Vienna lager, rather than a true pils. Still, it’s a very nice, drinkable brew that would serve its consumer well over the course of an evening. I’d be very interested to visit the ‘Burgh again in the near future and re-sample their new production. While this guy is a very nice and tasty brew, it would be tough to call a pilsner. Beer is a rich source of nutrients. Beer, particularly unfiltered styles, can contain magnesium, selenium, potassium, phosphorus, biotin and multiple B vitamins. It can also be a source of protein. Tim Surprise, along with some investors, started Arcadia Brewing Company in 1996 in Battle Creek, Michigan, and quickly established a stellar reputation with his traditional English ales. 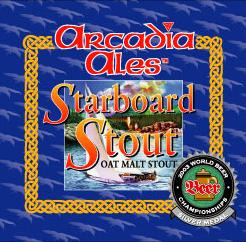 Using traditional brewing methods and imported two-row malts, most of Arcadia’s ales are relatively true to style and they’ve garnered numerous awards over the years. They also have a brewpub attached to their production facility downtown and a good number of their brews are available for distribution throughout the northeastern and eastern Midwest states. Michigan Brewing Company has long been an oasis for cross-state pilgrims traversing the Great Lakes State on Interstate 96. Located at the Webberville exit (#122), it had for years occupied the “log” pole barn behind the Mobil station, with a friendly tasting room in front of the production facilities to welcome guests. Several years ago, proprietor Bobby Mason moved the entire operation around the corner into the industrial complex behind the McDonald’s, where the pub was greatly expanded and now includes a full menu, free peanuts, some odd bar games and an always eclectic clientele. In addition, the public area includes a homebrew shop and collectibles store. The production facilities have expanded as well, to include a much larger brewing capacity, which has allowed wider contracting operations, along with a distillery and classrooms, many of which operate in conjunction with the distilling laboratory at nearby Michigan State University. One of their longtime house brews is their High Seas IPA, which is also distributed in many areas of the state. While MBC tweaks their recipes pretty regularly, this is a more traditional IPA, in the sense that it’s both high gravity and generous with the hops. Checking in at around 7.5 percent, it leads off a spicy Cascade dry hopped aroma and immediately warms the palate with a nice malty fullness. The sweetness shifts quickly into a sharp hoppy bite and rolls off the back of the tongue and into the exhale with a long, lingering dry finish. Classic. If you’re into the huge IBUs, this one may be a little less satisfying than others, but for an IPA with a little more balance, this would be one to seek out. As MBC can be inconsistent overall, this is one of their best and most reliable offerings. So I’m relatively new at this reviewing stuff, so before I start getting on my soapbox, I figured I’d better start with a few brews that I know I enjoy. So, while this is a labor of love, I wanted to explain a few of my prejudices up front. As a German weaned guy (a “German wiener?”), I’m not personally into fruit or spices. Nor am I into beers that are overly hopped, just for the sake of needlessly driving up IBUs as if it’s some sort of contest. I can appreciate those beers, but they’re not my personal thing. I look for balance, subtlety, creativity, consistency, and cleanliness of flavor. In the big picture, isn’t this the purpose in craft beer? To find a taste and an experience that you truly enjoy? Much like the perfect golf shot or hitting the sweet spot on the barrel of the bat, a special brew is a moment to be savored, because it’s not something you get to experience every time out. Anyway, for my first little matter of opinion, I cracked a Bell’s Best Brown, from the former Kalamazoo Brewing Company. Most people know this one for the fact that there’s an owl on the label and that it’s a winter seasonal, the opposite of Oberon (Solson, to those of us who remember), Bell’s top selling summer wheat. Best Brown is an “Amer-English” brown ale with a full and balanced body. It pours relatively heavy, bright-brown in color, with a nice, white chocolate head that lingers a bit on the glass. Served properly between 45°-55°, it opens with a maple, brown-sugary nose and sweet maltiness that rolls into a full mouthfeel. As it goes down, there’s a slight hoppy bite on the finish to balance and clean up the lingering sweetness. The balance is exceptional. It goes well with spicy foods, although it can get a little filling with a large meal. As a session beer, it can also get a bit sweet over time, although serving it a bit colder can help. While Best Brown is, for some reason, not as popular as the Winter White or Two Hearted over the winter monthsand not even in the ballpark of Oberon, in terms of sales—it remains one of Bell’s finest and most consistent offerings and is one of my personal favorites among their lineup. 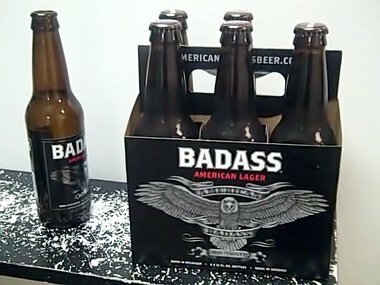 Eighty percent of the beer made in the United States is now controlled by two companies, one based in Belgium and one in South Africa. The top American owned brewer is Boston Beer Company (Sam Adams). The top American owned brewer that brews all its beer in one location is Sierra Nevada. Well, to be honest, I was going anyway, but I figured I may as well try to keep my wits about me and pass along a few thoughts as I explored the fabulous world of Michigan beer in the Michigan Brew Brewers Guild Winter Beer Festival, located in the parking lot behind center field at the West Michigan Whitecaps’ Fifth Third Park, just north of Grand Rapids. This is the third year the Guild has held the event at the ballpark and they keep learning and improving every year. The first year was actually in the ballpark, along the concourse above the stands …but that proved to be too crowded. 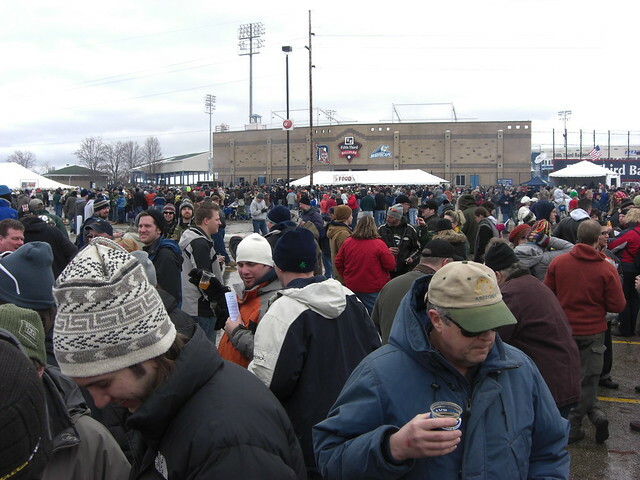 Last year moved outside the park to the outfield lot, but the setup was plagued by too few “used beer departments” which caused LONG lines for relief. This year, they got most things right as the festival fenced space was expanded and they just about doubled the number of bathrooms, along with adding eight new breweries to the lineup …not the least of which was Bell’s Brewery, the largest player in Michigan and the 21st largest in the U.S., in terms of volume. 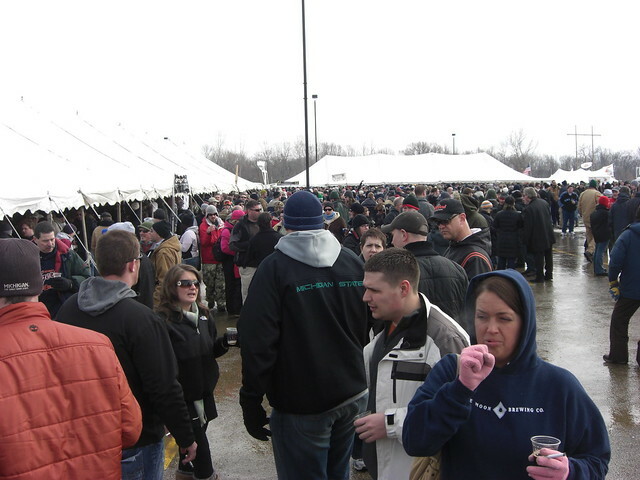 Unlike the horrific Beer Fest movie, this beer fest featured an amazing array of tasty and innovative brews from among the seventy plus breweries occupying the Great Lakes State. Click here for a list and the full program. For the second year in a row, the event sold out ahead of time, even with the expanded allotment of 4000 tickets. As a Guild member, I was fortunate enough to snag VIP entrance—which meant an hour’s head start and access to the indoor VIP area within the stadium. While I was happy to get the early access and avoid the lines for a few choice early selections, I never did make it to the VIP area, as that would’ve cost me time in the beer tents. Upon entering for the day—after the ID inspection—I checked in to receive my bag of 25 tokens for samples, roughly 3-6 ounces each. 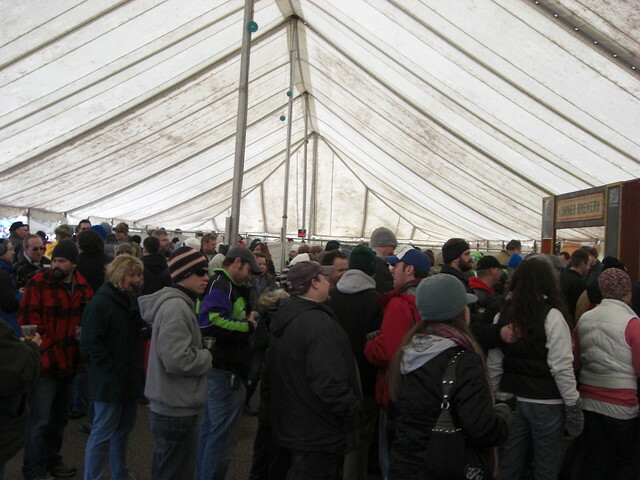 There were then five huge tents to explore, each with a lineup of brewery stands arranged (mostly) in alphabetical order. For breaks, there was a half dozen large fire pits for smokey treats or a warm up. There was also a large food tent, just in front of the VIP area inside the ballpark, featuring some ballpark food and huge roasted turkey drumsticks, which were nearly impossible to eat without wearing a portion on your person. I managed to acquire about 15 extra tokens from a friend “who didn’t want any beer,” and after highlighting a few of my personal “must tries,” set off to get a few notch marks in my program. I concentrated on beers that I had never had before. Among the highlights, Blue Tractor out of Ann Arbor had a surprisingly strong lineup and a dynamite Schokolade Weizen, Bell’s Brewery released samples of Batch 9000 and Black Note Bourbon Barrel Aged Stout, Sherwood Brewing of Shelby Township had an incredibly interesting Gunpowder IPA—made with habanero peppers—Darkhorse Brewing featured a wide and varied selection of brews, including a Donut Beer, and Frankemuth Brewery reawakened with a few classic German brews. The crowd was abuzz over Bell’s, of course, with chants of joy and anticipation at the tapping of new brews as they rotated four taps throughout the day. There was also a big response for Jolly Pumpkin, Arcadia, Walldorf (Marshall), Arbor/Corner and Dark Horse. If you’ve never tried Jolly Pumpkin, seek them out when in Michigan. Ron Jefferies has a few things on tap that you’ve never tasted before, guaranteed, including his Flemish and Belgian sours. They’re not for everyone, but they’re always creative and well done. The atmosphere was festive and fun. While most everyone was bundled up for the chilly weather, there were a few “dressed” for the occasion with some rather creative attire, including costumes, crazy hats and even a mink coat. Random cheers and toasts would break out and the lines were usually never more than a minute or two—and always polite. By 5:00 p.m., I had somehow managed to conserve a few tokens, thanks to my “extra” supply, but my ride was punctual so I was on my way. You, too, should be “on your way” here if you’re in the neighborhood next winter. As always, check out their website.